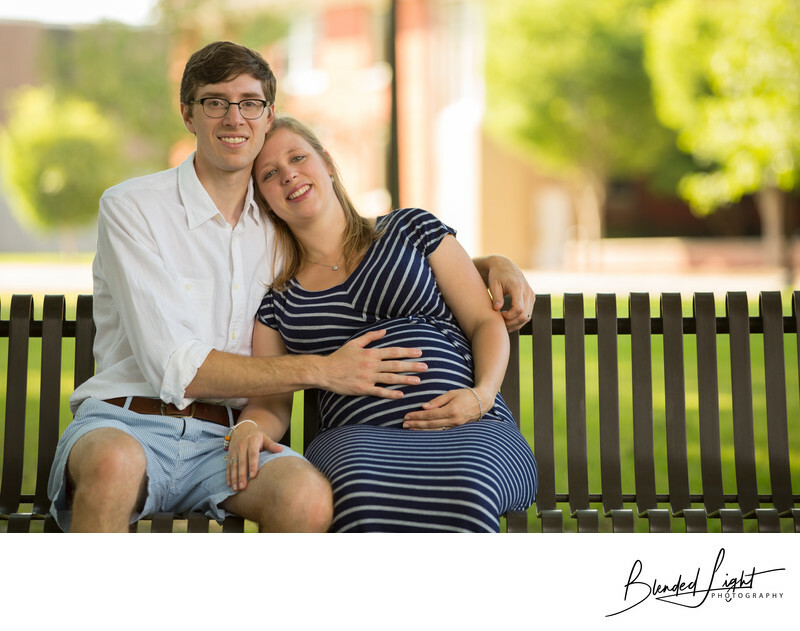 Both being ECU graduates, using campus for their maternity and family session was an easy choice. Along with their 2 boys, this late afternoon session was full of energy and a lot of fun. Part of being a family photographer is the ability to get people to relax and be natural for the camera. Even though I knew this couple from church, there is still a little tightness at the beginning of any session. One way to work around this is to start with a very basic picture of the family or, in this case, just mom and dad seated on something. Sitting puts people at ease by allowing their body to relax naturally and let's them feel a little more at home. With the couple seated, I simply asked dad to put one arm around his wife and one hand on her belly. As almost all women do, she automatically leaned in to him and put one hand on his knee while placing the other gently under her belly. With background being much brighter than they were, I placed an off camera flash to their left to provide enough light to blend them into the natural background. A very simple, but very beautiful shot! 1/250; f/3.2; ISO 250; 155.0 mm.